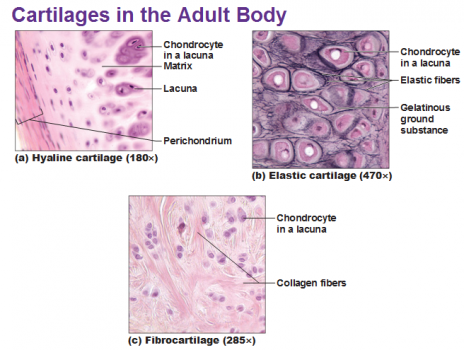 Cartilage is a type of supporting connective tissue . It is a firm tissue but softer and more flexible than bone . it is a firm gel that contain polysacchride derivaites called chondroitin sulfates which complex with protein in the ground substance forming proteoglycan . 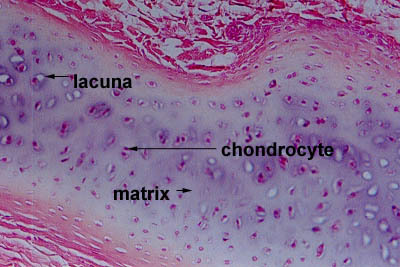 chondrocytes are the only cells in the matrix and they occupy small chambers called lacuna . 1- Outer Fibrous Layer : Which provide protection , mechanical support and attaches the cartilage to other structures . 2- Inner Cellular : It Is Important in the growth and maintenance of cartilage . The matrix contain closely packed collagen fibers making it tough but slightly flexible . Example : Connection between ribs and sternum , nasal cartilage and articular cartilage ( which cover opposing bone surfaces in many joints ) . The matrix contain interwoven collagen fibers making it durable and tough . Example : between spinal vertebrea and around the joints . The matrix contain elsatic fibers making it flexible and reselient . Example : the auricle of the outer ear . chondrocytes responsible for cell division and daughter cells produce matrix . occur during embryonic level and continue till the adolescence . cells of inner layer of perichondrium undergo division and inner most cells differentiate into immature chondrocytes which produce the matrix then they mature into mature chondrocytes . - both intersitial and appositional growth occur during development but neither of them occur in normal adult but under unusual circumstances appositional growth may occur as in cartilage damage (minor damage) . The mechanical behaviour depend on interaction of its component : proteoglycan , collagen and interstitial fluid . In an aqoues environment , proteogylcans are polyanionic which means the molecule has negatively charged sites that arise from sulfate and carboxyl . In solution , the mutual repulsion of these negative charges causes the aggregated proteogylcan to spread out and occupy a large volume . In cartilage matrix , the volume occupied by proteogylcan aggregates is limited by entangling collagen framework . when the cartilage commpressed the negatively charged sites are pushed together so increase the mutual repulsion force so add to the compressive stiffness of the cartilage .But non-aggregated protoegylcans is not effective in compressive load since they are not easily trapped in the cartilage matrix .Damage to the collagen framework reduce compressive stiffness . The mechnical respose of the cartilage is strongly tied to the flow of fluid through the tissue as when deformed the fluid flow across the cartilage and articular surface also when a pressure difference is applied . That is All of the solid component of the cartilage (lipid , proteogylcans ,cells and collagen ) are lumped together to constitute the solid phase of the matrix and the interstitial fluid that is free to move constitute the fluid phase . Participation in certain sports appear to increase risk of osteoarthritis ( result from breakdown of joint cartilage ) . Activities that involve torsional loading , fast acceleraion and decclaration , repititive high impact and high level of participation increase risk of osteoarthritis . Increasing risk of osteoarthritis are related to excessive exercise or abnormal joint loading But some levels of loading and exercise are benfecial for joint health as exercise has a enhance production of matrix molecules so it can have a positive effect on joint health so exercise has both benefecial and detrimental effect on cartilage it produce positive biomechanical changes , reduces the pain and increase function of people with arthritis but sports injuries are contributors to osteoarthritis . ↑ 3.0 3.1 3.2 Fredric H.Martini ,Judi Nath ,Edwen Bartholomew , Charles M.Seiger ,Damian Hill . Fundamentals of Anatomy and Physiology .9th ed , 2011 . ↑ 5.0 5.1 Carol A.Oatis . kinesiology the mechanics and pathomechanics of human movement , 2003 .